Reverse Image: American eagle in flight. 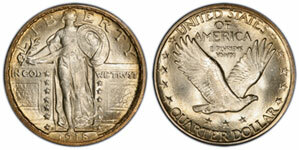 $2.7036 is the rounded silver value for the 1916-1930 silver quarter on April 25, 2019. This is usually the value used by coin dealers when selling these coins at melt value. However, the total melt value is continued below. $2.7076880393 is the total melt value for the 1916-1930 silver quarter on April 25, 2019. The "Year" column lists the year and mint mark on the coin -- D is for Denver, S is for San Francisco, and P is for Philadelphia. A coin without a mint mark means it was also minted in Philadelphia. The "Mintage" column is the number of coins struck and released by the U.S. Mint. The "Numismatic Value Range" column represents what people typically pay for that type of coin (usually a very wide price range depending on the condition). There was a design transition for Standing Liberty quarters during the 1917 issues, and they can be distinguished by "old" or "new" in the table below. The PCGS price guide on silver Standing Liberty quarters has an updated list of certified coin prices.